Villeroy & Boch Entrée Crystal Glass Set Offer! 12th Jun 2018 in General, Special offers! Summer special offer from UK Bathrooms! Summer and our latest special offer is finally here, just picture it- long, light summer nights with friends and family around enjoying a BBQ while the kids play in the garden – pop open a bottle of wine and pour a glass or two for your guests in your new Villeroy and Boch crystal glass set, complimentary from UK Bathrooms on your next Matki order over £500. The offer is simple: Enjoy a set of Entrée crystal glass wineglasses by German luxury-lifestyle bathroom and kitchen brand Villeroy and Boch, free with every order of Matki purchased from us over the value of £500.00 between now and midnight 30th May 2018. It’s the last few days of our Warehouse Clearance Sale. Make sure you don’t miss out on the below cost prices we have on for Cleargreen & Clearwater Baths. To take advantage of these low prices please see our clearance section. GOLD for Jack and Chris at Rio 2016! These dedicated lads from Yorkshire have made history, Team GB’s first ever Gold Medals in the Men’s synchronised 3m springboard! A huge congratulations and very well done to Jack and Chris from everyone here at ukBathrooms! As some of you will know Jack’s Dad is our very own Development Manager David. We know David is ecstatic with pride today, he has already been on a phone interview on BBC One’s BBC Breakfast program and no doubt will be busy today with interviews and calls. As such he has a well deserved day off today. The rest of us in the office will be celebrating today with some calorific local cake and Yorkshire tea! Well done guys, it couldn’t have happened to nicer harder working people! Rio 2016 has begun and everyone in the ukBathrooms office will be cheering on Team GB diver: Jack Laugher! Jack, the son of one of our long-standing members of staff has gone from strength to strength over the years competing with other world class divers and winning a steady stream of medals and prizes. Jack will be recognisable to the general public for his diving, but also alongside other Team GB athletes on Aldi’s recent value fruit and veg advert campaigns, amongst other sponsorship deals. Jack has certainly put the hard work in over the years, and kudos to Jack’s parents for their commitment and support, early training starts and such a hectic schedule can’t be easy to manage! Jack will also be diving with team mate Chris Mears in their Synchronised Dive, the pair have been training and competing together, good luck to them both we know their hard work and dedication will pay off. From everyone here we wish Jack and Chris the very best of luck in Rio 2016! Huge savings on all bathroom ranges this Bank Holiday weekend! To celebrate the traditional spring festival of May Day, UK Bathrooms are offering huge savings across all their bathroom ranges, but hurry, this Bank Holiday sale is only available till Monday the 4th May. With summer fast approaching, now is the best time to start planning your new bathroom and if you order this weekend you can be sure that you’ll have a brand new bathroom before the Spring Bank Holiday at the end of May and all for a great price. The ultimate spa bathroom features revealed! Everyone like to be pampered, and our latest study has found that the majority of Brits would like to create a home spa experience in their own bathroom. Steam showers, whirlpool baths and home saunas topped the list of must have features of a dream bathroom. Whether it’s due to a lifestyle shift or the fact that traditional spa days are getting more and more expensive, males and females across the country are choosing to pamper themselves in their own homes rather than booking expensive treatments in beauty salons and day spas. Hydrotherapy/whirlpool baths came top of the list, with over 27% of women and 25% of men naming it as their top home spa feature. A sauna/steam shower was also popular among respondents with 20% of women’s votes, and a surprisingly higher men’s vote of 25%. Showers featured highly on the list with sensory showers and massaging showers both coming in the top five. Foot spas also figured highly with 28% of the vote. Our researchers have been busy compiling more data about the relationships Britons have with their bathrooms and have found that a staggering 65% said that they are jealous of other people’s bathrooms. In our poll the bathroom was narrowly beaten by the kitchen as the most likely room in the house to be jealous of. The most common bathroom features Britons were most jealous of included Jacuzzis/hot tubs with 26% of the vote and large or feature baths comprising of 24% of the vote. The study also found that the kitchen, bathroom and bedrooms were the most converted room in the house. We asked 1,824 UK residents over the age of 18 and asked, “How often do you get jealous of other people’s homes?” to which 64% said they regularly got jealous, 27% said they rarely got jealous and 9% said that they never got jealous. In our final question we asked if any of the participants had remodelled a room in their home after being jealous of someone else’s. A staggering 62% said that they had remodelled a room after being jealous of someone else’s, with 51% stating that they remodelled the bathroom. Finally, respondents were asked if they had ever remodelled or refurbished a room after feeling jealous of another person’s house, room or fitting, to which 62% stated they had. When asked which room this applied to, the most popular room to change following a trip to another person’s house was revealed to be the bathroom (51%). 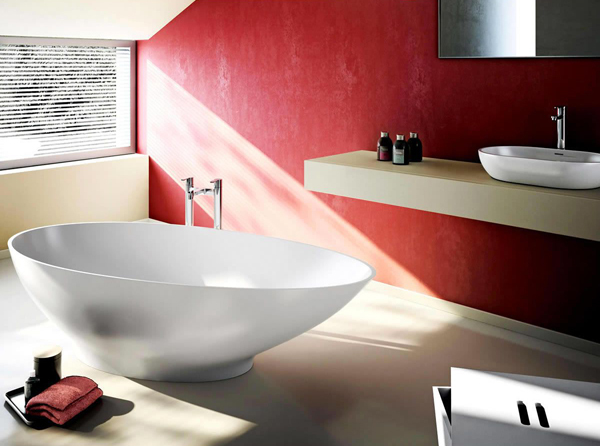 Bathroom trends are forever changing, but it seems that traditional designs are back in fashion. Our researchers have found that classic features such as roll top baths and double-pedestal basins have once again become popular for homeowners. Roll top baths and double-pedestal basins topped the list of the most common classic features included in bathroom renovations over the past year. Our study polled 1,438 UK residents who had renovated their bathrooms over the past year and asked, “Did you include any classic bathroom features in your bathroom refurbishment?” 54% of respondents said that they had fitted some kind of classic feature to their bathroom, the remaining 46% said they did not feature any classic features in their bathroom refurbishment. Our researchers have crunched the numbers from the respondent’s data and worked out that the average Briton spent £2,072 on traditional features during their bathroom renovation. We are fortunate enough here at UK Bathrooms to work with some of the best bathroom manufacturers in the world and always pride ourselves of providing our customers with some of the most inspiring bathroom designs for them to create their own. So, it’s no wonder that we have been awarded the Best of Houzz for design for the second year running. Houzz is the leading platform for home renovation and design, and connects millions of people online with some of the most innovative interior design brands in the world. UK Bathrooms have been chosen by the 25 million plus users of the Houzz community to be awarded with the Best of Houzz 2015 prize for design. We now get to display our Best of Houzz 2015 award on our Houzz profile, taking pride of place next to our 2014 award and helping users around the world to learn even more about our business and products. Houzz is a leading portal for home renovation and design, providing over 25 million users worldwide with everything they need to improve their homes. From decorating a spare room to building an entire home, Houzz connect homeowners, designers and enthusiasts with over 15,000 builders, interior design specialists and suppliers from all over the world. This vibrant community allows users to find inspiration, get advice about their projects, buy products and hire professionals to turn their ideas into reality. Check out the website today and see what inspiration you can find by visiting the UK Bathroom Houzz page. Our researchers have been busy finding out what puts off prospective home buyers when it comes to the bathroom and for most people it was ingrained dirt and black mould. Our study asked 1000 UK residents “What do you find most off putting in a bathroom when buying a house?” to which the majority of respondents (50%) said that black mould or a bad silicone finish was off putting in the bathroom. 24% of respondents said that they would be put off a property that had an old or outdated bathroom, and 14% admitted that the colour scheme of the bathroom would be a turn off. Cracked or damaged tiles would put off 9% of those questioned, as matching or replacing individual tiles is not an easy task, while others said that a newly fitted bathroom would cause them concern, leading them to ask what was it hiding and worries about whether it had been done on the cheap or not. Some of those questioned said that the positioning and layout of the bathroom would put them off especially if the space was not used well, while some said that bad pipework and wiring would also make them think twice about buying a property as it can be expensive to upgrade. Black mould as well as looking unsightly, can, in some cases affect your health too; having black mould in your home could mean that there are ventilation issues within the home. Ventilation is key to reducing black mould and we would suggest fitting an extractor fan to help with the problem. Cleaning regularly and using mould removing cleaners will also help you to keep on top and often prevent black mould from forming.